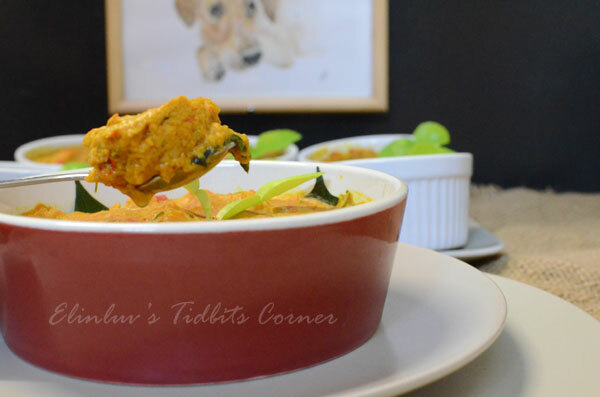 I have taken a liking to zucchini and zucchini flowers. 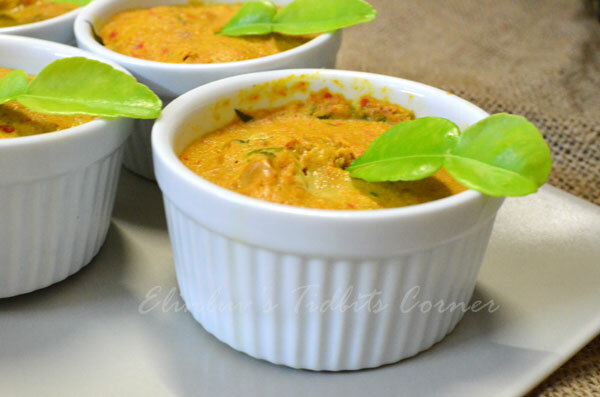 I have added them to my list of dishes to be served more often in our daily meals. Today, I am making salad out of zucchini. 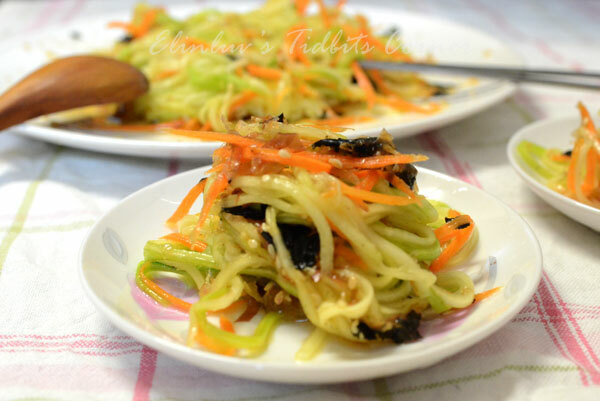 Julienne them into long noodles and served as salad. 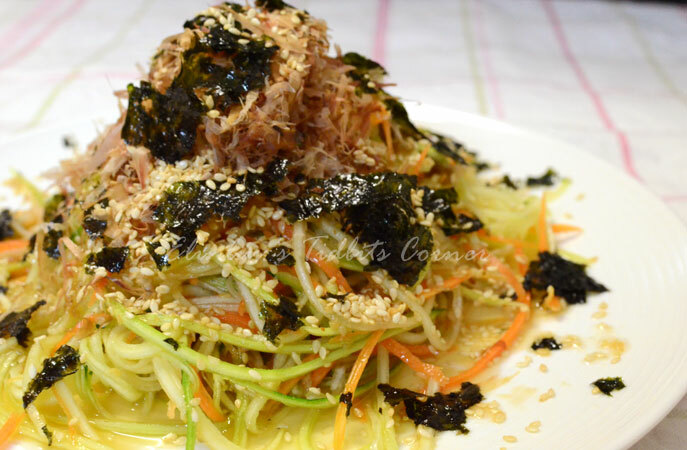 Zucchini noodle salad with wafu salad dressing is a hit with the family. For me, personally, I find this salad very delicious and refreshing especially served chilled. For healthy conscious people, this is one good one, little calories and zucchini eaten raw preserve more nutrients than cooked ones. Try this , you will love it if you are a salad person. I AM! Put all the dressing ingredients above in a small bowl. Whisk the ingredients together to create a perfect blend. Leave it to rest for 20 mins to allow a more intense flavor. 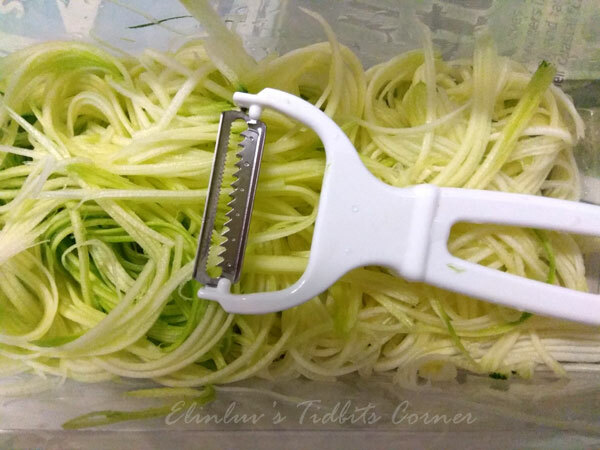 Julienne zucchini into long noodles . Lay them on a salad plate together with the onion slices. Drizzle the salad dressing over the zucchini noodles . 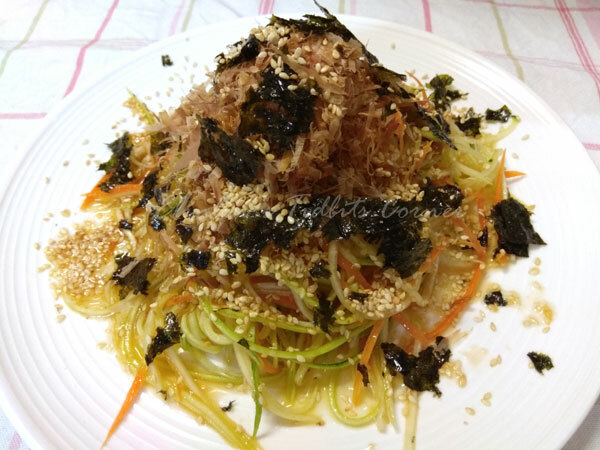 Topped with bonito flakes and toasted wasabi flavored seaweeds. Note: I like it chilled. It taste better if chilled. Can be served at room temperature. It feels like Christmas has come early. The seasoning consists of ingredients like sea salt , black pepper and raw honey. 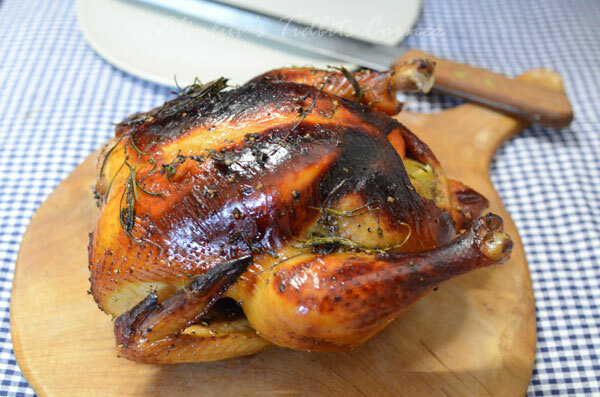 For extra flavors, I added fresh herbs like rosemary, lemon thyme to give texture and fragrance to the chicken and butter on the chicken to give it a glaze look after roasting. It is good to marinate the chicken overnight to have a more intense flavor. I used greaseproof paper to line the base of the baking pan for easy washing :) Nobody likes the washing, that includes me :p I love to cook but I hate all the washing that comes with the cooking ! stuffing will taste delicious ! 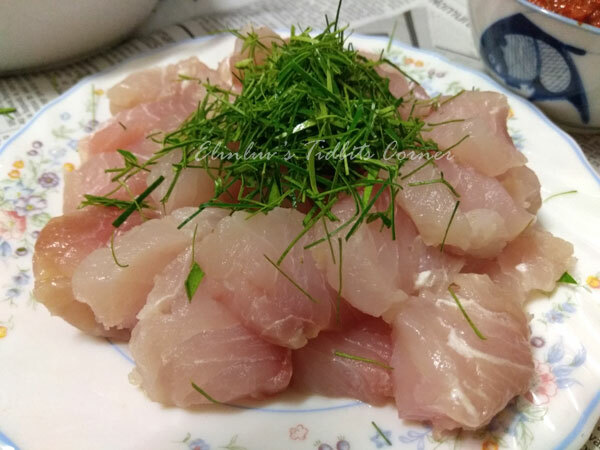 Marinate chicken overnight or for at least 4 hours with ingredients (A). 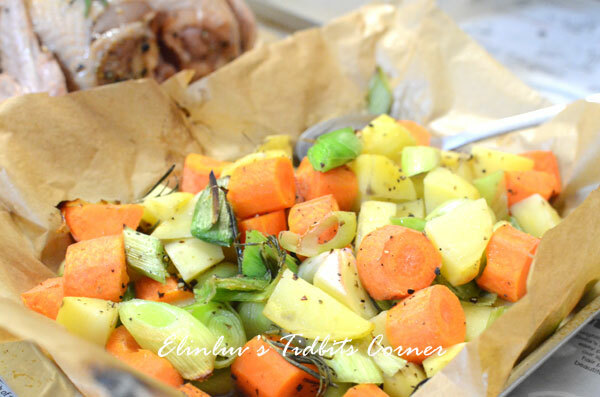 Roast the cut veggies for 15 mins @200C . 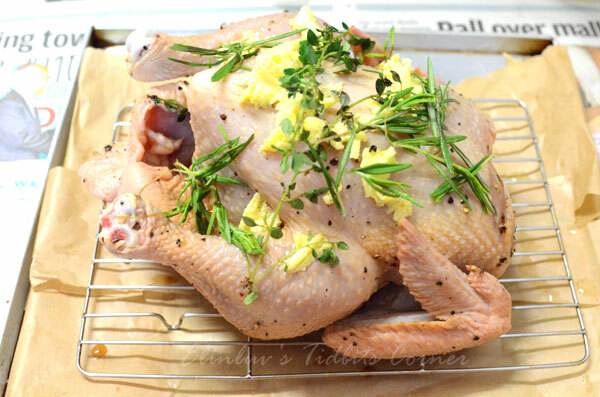 Take the chicken out of the fridge 1 hour before roasting, Rub ingredients (B) all over the chicken and spread butter all over the chicken. 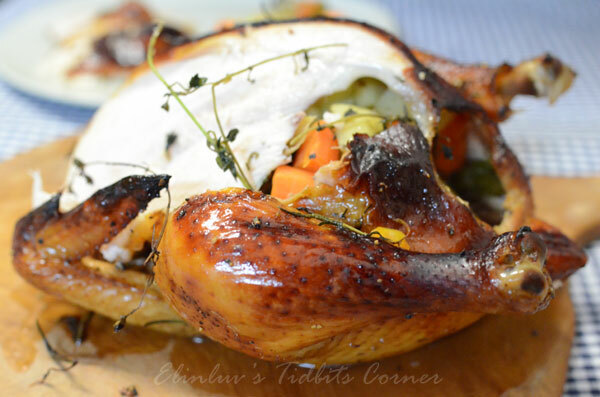 Stuff the roasted veggies into the cavity of the chicken . 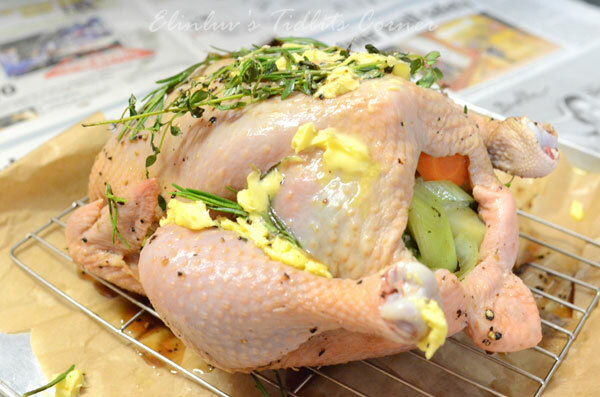 Place the stuffed chicken on a rack on a lined baking tray and roast for 50-55 mins @200C. 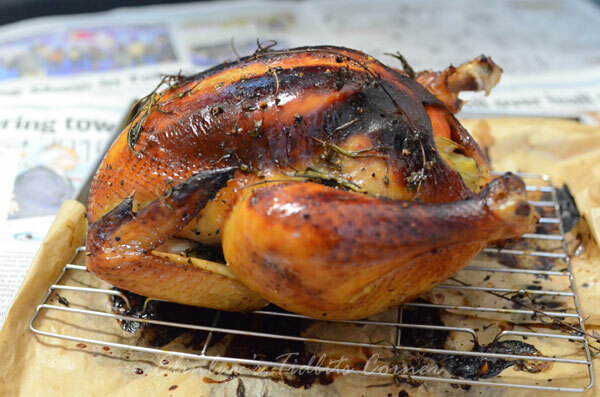 Rest roasted chicken for 15 mins before carving. My all time favourite melon..the bittergourd . Since I love it so much, I decided to plant my own bittergourd plant so that I can have it all round the year. Nothing beats homegrown edibles and homecooked. I promised myself that after retirement, I must do this and I have achieved many things thus far including planting my own edibles. I harvested many bittergourd since planting them this year. 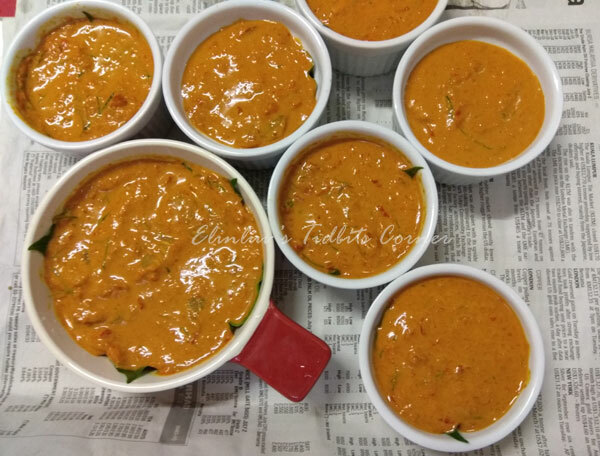 There are many ways to cook bittergourd ( you can check my recipe index for ideas on how to cook them and this is my lastest recipe using homegrown bittergourd. 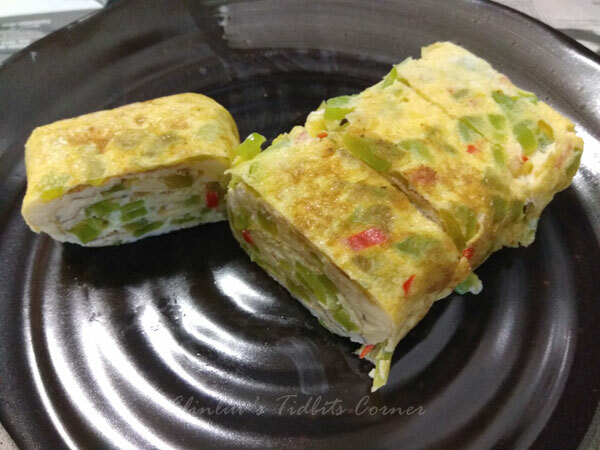 Making them into rolled omelette is another way of cooking bittergourd. Love it and this is one way to make my 'Wildboar' eat bittergourd...just kidding, this will appeal much to kids too. Homegrown ones are not that bitterish , or maybe it is the homemade fertiliser that made it less bitterish. This is just my silly assumption of course. Anyway, it tasted so good that I have requests from the WB to make more next time. After cooking them in omelette, it still have a slight crunch to it as you bite into the omelette. 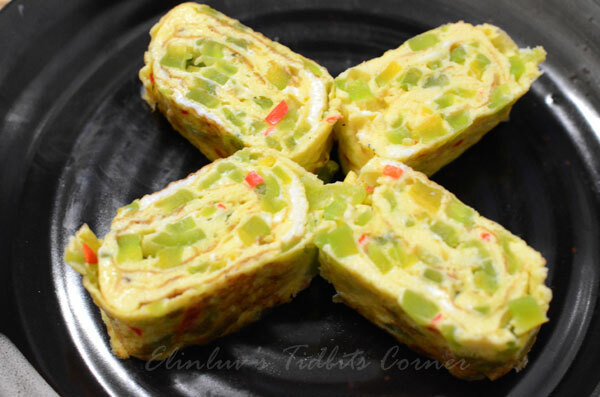 Great rolled omelette for the family, firstly it taste good, secondly it gives a great presentation when serving. Especially if you have guests for dinner. 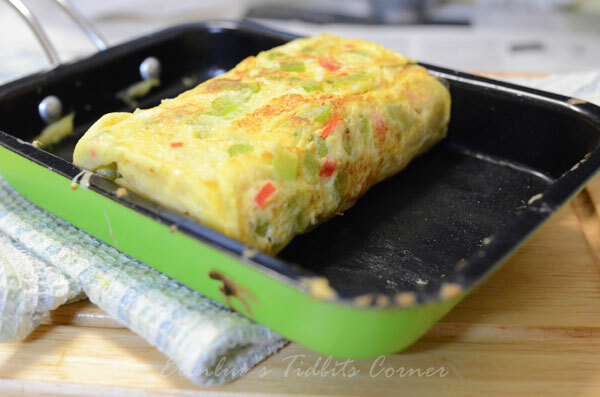 Thirdly kids will go for it,believe me :) Back to the recipe, I used the same recipe as Korean egg rolled omelette . 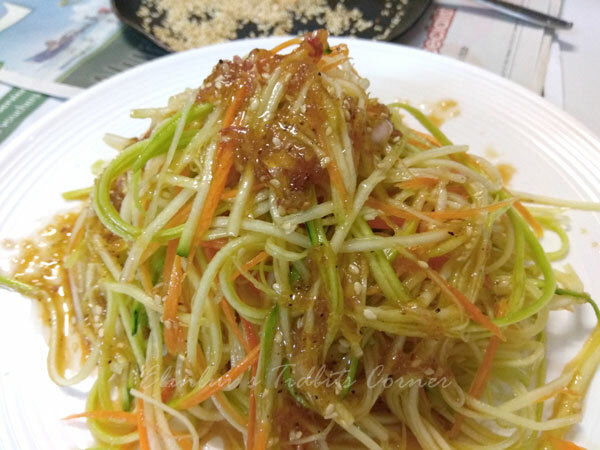 Instead of using the spring onions, diced carrots, I used bittergourd . The rest of the ingredients are the same..method too :) I love this rectangular pan from Daiso so much. It really serves its purpose. 3. 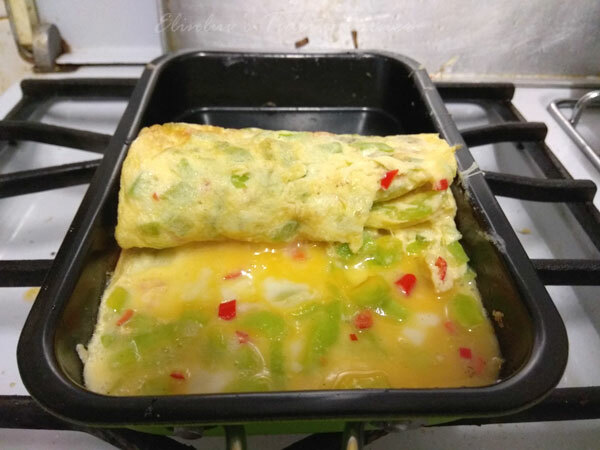 When pan is hot, pour a ladleful of egg mixture to cover the whole pan, once the egg mixture has lightly set, gently fold over and as you keep folding, shape into square, once you finish rolling, push to one end of pan, add 3/4 ladle of egg mixture to cover the pan and reduce heat . Make sure uncooked egg mixture’s attached to the first batch of egg roll. 5.. 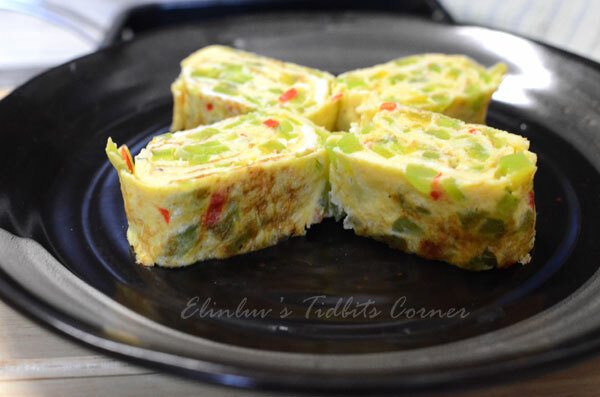 Remove from heat and let the rolled omelette rest in skillet for about 1 to 2 minutes. 6. Slice into 3/4” wide bite size pieces and serve . Hubby has been asking for Otak Otak. I told him I will make for him when I am back in Ipoh . I made for him many years ago but I have forgotten the ingredients required to make otak otak , so I googled for Alan's recipe. 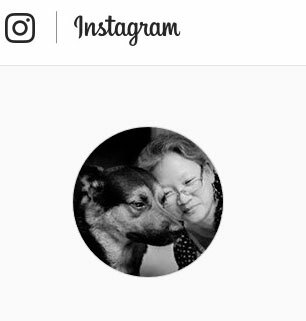 I know he had posted one some years back. 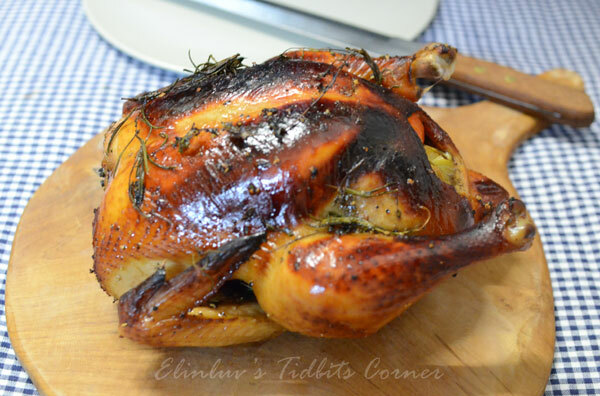 Found the recipe on his blog, bookmarked it and as soon I was well rested, I deliver what I promised him . 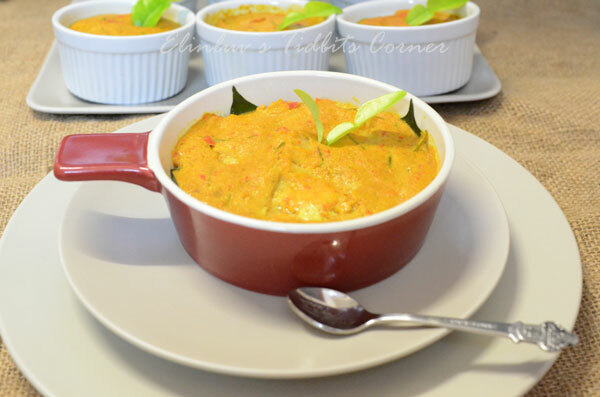 You can hop over to Alan's post for a more informative write out about this Penang Otak Otak. I had a great time making the otak otak the hubby desired :) Even though it involved a bit of hardwork , it was worth it when the hubby keep saying " this is so good , keep the recipe and make sure you stick back to this recipe when you next make this dish again " Wow...that is the most authoritative instruction given out for the day :) I do not have banana leaves so I steamed the otak otak in ramekins. I thank God for some of the herbs needed for making otak otak are growing well in my lil space. I have turmeric, galangal, kaffir lime leaves, daun kadok in my lil space. Love this lil space of mine . When I am away, I have to keep texting hubby to water the plants for me :p I dont send him love notes but text him to remember to love my plants LOL! Or he can forget his Otak Otak! and every mouthful is bursting with flavors! 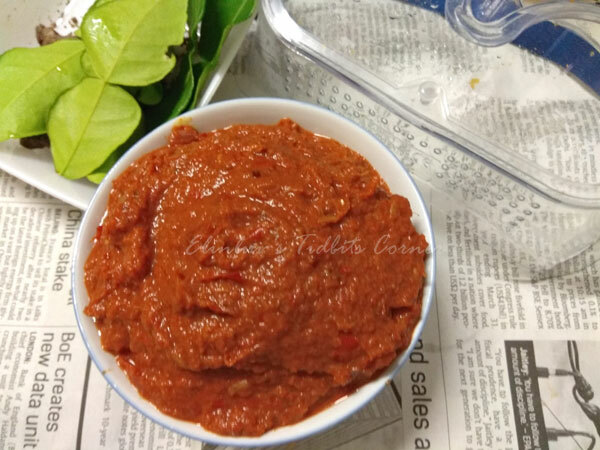 To prepare rempah, pound or blend all the ingredients into a fine paste. 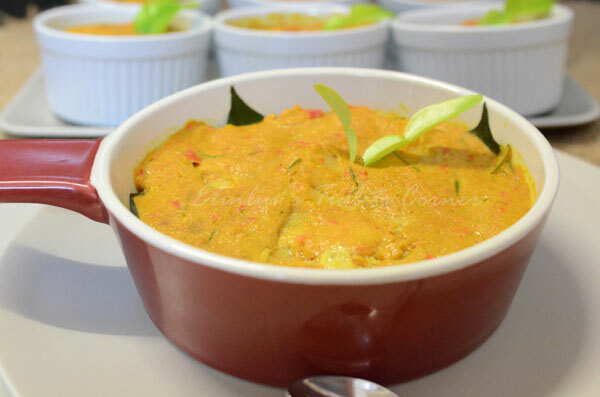 To prepare otak filling, place all custard paste ingredients and rempah in a large bowl and mix well. 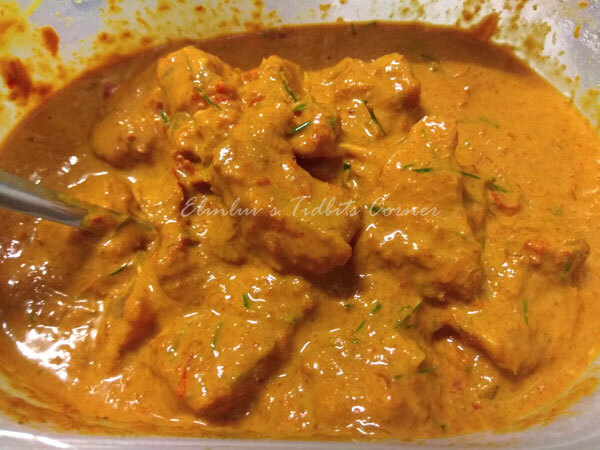 Cover the mixing bowl with clingfilm and leave to marinate in the fridge for at least 4 hours, preferably overnight. 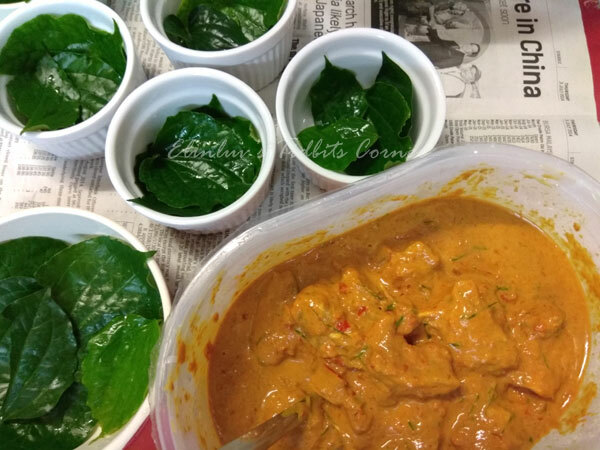 Fill the ramekins with the otak otak fillings .Cover top of ramekins with aluminium foil to prevent condensate from going into the otak otak while steaming. Serve immediately with rice .